When I was younger, I can remember my parents bringing us kids to the beach, where we’d spend hours in the boardwalk arcades. I’m sure there must have been times when my parents wished they would just open an arcade closer to our house so they wouldn’t have to drive out to the beach. Anyway, one of my favorite games from back then was skee-ball. For anyone who has never played, it is basically a bowling game where you roll 10 balls down a short alley, up a ramp, and try to get them into different holes for points. The harder the shot, the higher the points. And for your efforts, you got tickets you could turn in for some really junk. 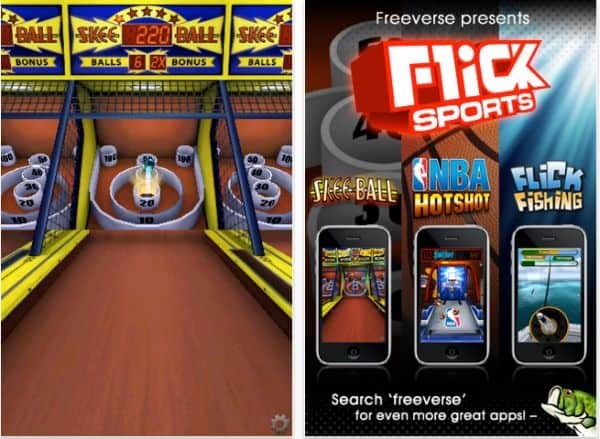 Freeverse has now brought all that fun, including the junk prizes, to your iPhone. All you have to do is flick the ball and it rolls up the ramp, just the way I remembered from my childhood. But this Skee Ball iphone game is even more fun now because I don’t have to drive to get there, and I don’t feel stupid trading in my tickets. And they really do have a counter with prizes that looks just like what I remember, with the same kind of stuff. There are the standard things in Skee ball game for ipod touch or iPhone, like vampire teeth, cheap digital watches and rubber spiders. But for some added fun you can also get custom balls to use when you are playing. Now that’s something those arcades never had. And as you build up points, you can compare your hoard of tickets to everyone else through the worldwide hi-scores. And with the Plus+ network you can see the current leader-boards and even challenge your friends. If you don’t find yourself getting addicted to this game, you will at least get nostalgic for the good old days. You can get Skee-Ball iPhone game from the iTunes Store now for only $0.99. Go to: the iTunes App Store.